Highland Park High School | Hutchinson Design Group, Ltd.
Highland Park High School: Masonry restoration consisted of tuckpointing, coping stone removal to install new stainless steel through wall flashing systems, and cutting in of new expansion joints. 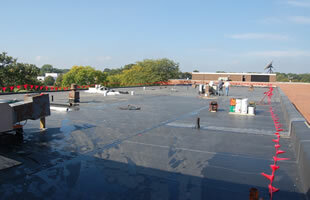 All 121,660 square feet of roofing at Deerfield High School replaced in this project is low slope. 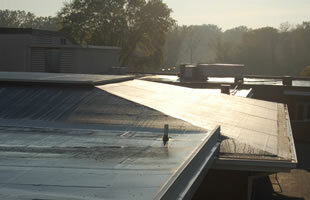 The existing roofing was composed of numerous layers of coal tar pitch and gravel, insulation and light weight concrete, averaging over 14” in thickness. 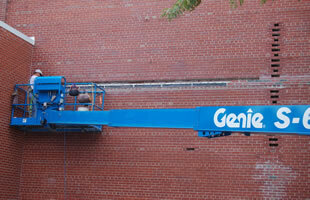 The roofs were cluttered with large roof top units, numerous conduits and refrigerant piping, duct work and IT cabling. Pipe fitters, HVAC technicians, control wiring experts, duct workers and electricians were needed to disconnect all the equipment and reinstall following the roofing in a much more arranged and workable manner. All roof curbs and HVAC ducts were raised. The new roof system design incorporated a vapor barrier, thermal insulation, cover board and a fully adhered 60 mil EPDM system similar to that of Highland Park High School. Following the new roof installations, new prefinished aluminum fascias, coping and counterflashing were installed on both schools.